The company also repairs the damaged graphics, replacement of banners and decals and painting at cost effective price. A team of highly experienced and trained experts will make sure that the graphics stand out as the best among others. Did you ever imagine, how your car would appear if you repainted and put new graphics of high quality which will capture an audience or change your drive in style? Let’s get to know how Regina Signs achieves their best when dealing with vehicle graphics. In this 21st century, the industry for advertisement is more advanced by introducing wraps that can easily be removed and replaced. Regina Signs Company notes this technology and puts it in practice. Wrapping your vehicle depends on shape, size of the vehicle as large vehicles like buses or trucks are easy to fix and the process gets more complicated with smaller vehicles. Wraps are meant to put across a message thus ease of visual interpretation is a contributing factor which allow the company to produce large wraps with high quality content. The information is limited so as to include important advert info for intended product. Wrap installation is also done by various specialized personnel who have experience and ensure executive fitting. Use your vehicle to create a visual impression when driving mile after mile. Expose yourself and sell your services to potential customers through vehicle decals. Regina Signs Company can do all this for you, it does not matter the type of sign you need. A powerful impression is created through making completely large decals with high quality customized colours. Regina Signs Company will always do the best to come up with brilliant ideas to customize your vehicle and leave it looking great. In today’s fast-paced business landscape, local companies are given the opportunity to think outside the box in order to amplify their presence. One popular strategy is organic advertisement, in which businesses successfully turn existing assets, say, a vehicle, into an effective tool for marketing. Vehicle graphics Regina is one way to strengthen your brand; by dressing up your fleet with decals and vehicle wraps, you can let the community know about your products and services as your cars pass by the road. Compared to print ads and stationary signage, vehicle graphics and vehicle wraps Regina boosts your audience scope due to the fact that it is mobile. When you drive your vehicle during the crowded areas at the best time of the day, more people get to see your advertisement. Advertising value is gauged per thousand impressions. There is a reason why a 30-second commercial on television is so expensive, compared to the less-dynamic radio announcement. But with vehicle graphics Regina, you get the chance to bypass restrictions in rates and placement. By simply driving your van around the neighborhood, you create a buzz and increase your brand’s awareness. Once you have planned the design of your vehicle graphics, it is important to choose an important provider to install the designs for you. Consider the color and durability requirements of the material. A local graphics company in Regina is your best choice, so you can easily communicate the changes you’d want to highlight. Pick a well-reputed, experienced provider that will give you the freedom to select decals and wraps that matches your standards. Know that with Vehicle Graphics Regina, you have a variety of options. Basic lettering is one of the simplest ways you can convey your message through your vehicle branding. We’ll help you stand out by using the best colors that matches your business style. Decals, on the other hand, are perfect for logo and other graphics you’d want to add to your vehicles. We’ll place them on the most noticeable parts of your car, such as the sides and the rear. Vehicle graphics Regina gives your company the attention it deserves. The best part: it lasts you for years! Make use of this powerful marketing strategy. 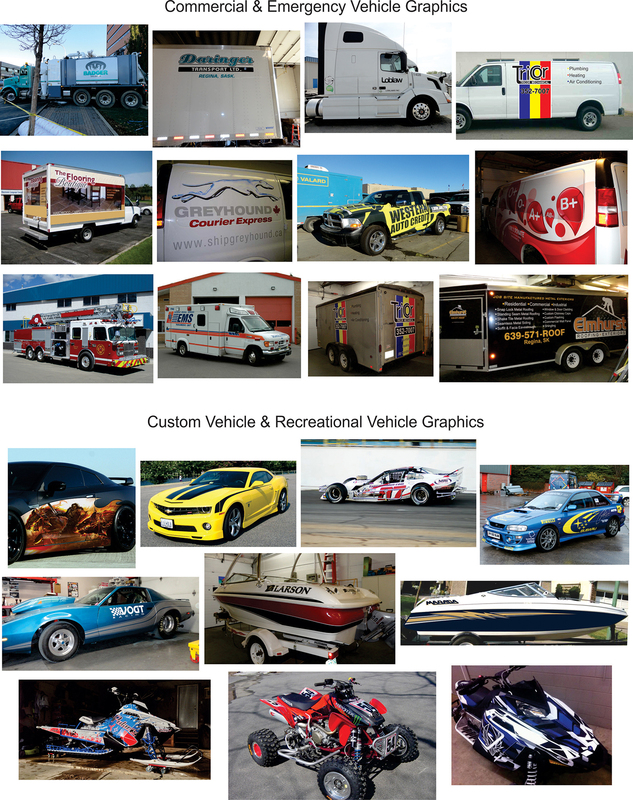 Call us today to inquire about our vehicle wraps and graphics!